The other day, we allowed you a peek into the AR-15 zombie destroyer. While that machine with zombie-slaying capabilities was a real demolisher, we’ve yet another amazing gun that bestows simple LEGO bricks with shooting functionality. 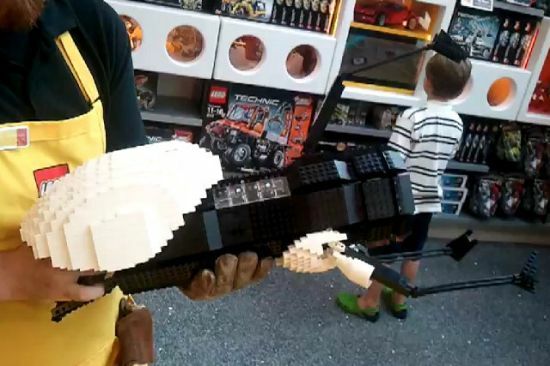 Entirely done in LEGO, the Portal Gun is the creation of a worker at the LEGO Store in Minneapolis. It’s not that mammoth a creation as the Battleship Yamato was since it involves the use of 2,000 pieces only. Any LEGO fan will sure like to lay his hands on this amazing work of art. It houses a LEGO Mindstorm controller that allows prongs to follow switch commands for carrying out open and close functions swiftly. The same controller is responsible for illuminating the contraption at will. The amazing LEGO gun took more than a year to realize its firing best. Those who wish to see the homemade stunner in person may visit CONvergence 2012 in Minneapolis, where the LEGO artist will demonstrate it for a cosplay.